soils of the Karonga Region of Lake Malawi. Famers use traditional methods which helps protect the environment whilst also providing a livelihood for the local communities. The smallholder farmers in the region work together as a co-operative to help ensure a fair and stable price for their rice. They are also continuing to ensure the best farming methods are used which are most suited to protecting their environment. As a co-operative they are able to increase their income and ensure better food security for their communities as well as provide support and education for their families. distribution of fairly traded products to the UK. 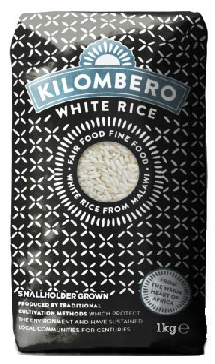 JTS is supporting the farmers of Northern Malawi by providing a fair and sustainable market for their Kilombero rice. Here at St Ivo, we are taking part in JTS’s ‘90kg Rice Challenge’ as part of a series of events by the department during Fairtrade Fortnight . 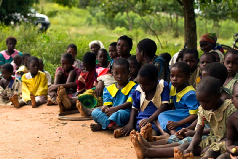 JTS have challenged schools, such as St Ivo (as well as churches and other organisations) to sell 90kg of rice - this is the amount of rice sold that would enable a Malawian farmer to pay for a year’s basic secondary education for one child. expectancy for both men and women is 55 years. Most of Malwai rely on subsistence farming, although with the changing climate, this is becoming increasingly uncertain. As few as 40% of children complete primary primary school (6-13 year olds) and a quarter of a million children haven’t even been enrolled in school. Education is one of the most effective ways to escape poverty and by helping us complete the 90kg rice challenge your contribution can make all the difference as it can send a child to high school for 1 year! All we need is 90 people to buy 1kg of rice each. We are delighted that thanks to your help & support we have completed the 90Kg Rice Challenge for 2016!